2002 Sound Edge Black Label Hats are on the way! What serial number are they? 007873 and 007874 - circa 1980. Here's the (nearly) complete Bruford 77-78 UK tribute kit. The only thing left to find is the 11" 2002 black label splash. Also found a Slingerland Buddy Rich Hi Hat stand that Bruford seemed to favor for many years. Awesome setup. I've got a 2002 11" red label if you need it. Thanks so much! I already have the red label 2002 11" splash... been looking for a black label to be as period correct as possible. Awesome - but did Bruford actually use an INDe tom mount? LOL! I took some certain liberties with some modern hardware, that is TRUE!!! If I went more true to Bruford's 77-78 kit, that 8 x 12 tom would be a Hayman and it would be sitting in a snare basket! Bruford didn't use Gibraltar Stealth racks either! The first studio I ever played in had a roto-tom kit. Ever since then I wanted one but I’ve had a hard time justifying it. Rodger Hawkins of the Swampers down in Muscle Shoals liked the Roto Toms in the studio too... this was his Pearl "Vari-Pitch" kit. Remo Roto Toms atop Pearl shells that could be played open or closed on the shell. Man, I would love to sit behind this kit, it looks so inviting! Bruford is in my top three drummers of all time! If you ever find yourself in CT Greg, you are more than welcome! So cool. I’m also a Bruford fan. Here is my 74 king crimson set. 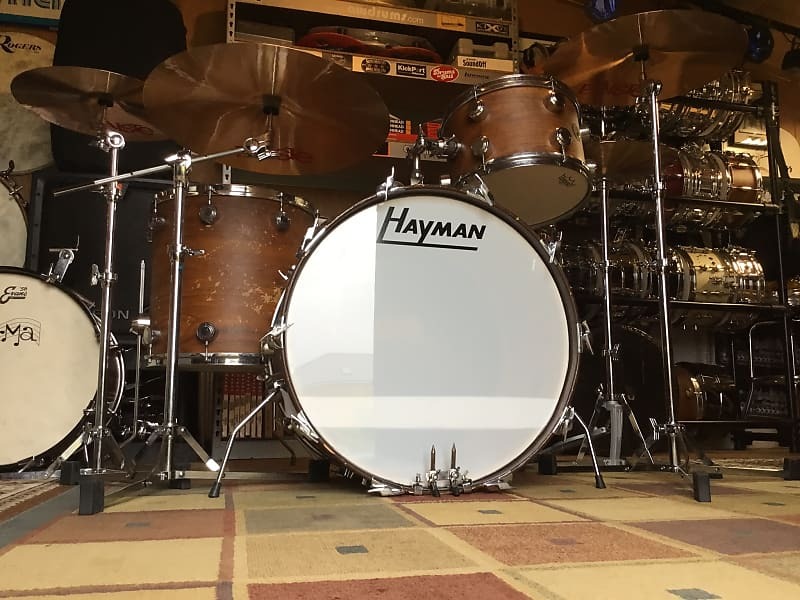 I tip my hat to you sir for actually having the Haymans and the uber correct Ludwig Maple Thermogloss in the 3 ply configuration. I also now realize that Bruford also used, not a 16 x 16, but a Ludwig B/O badge 14 x 14, 3 ply floor tom for his 77 - 78 setup with UK and the "Feels Good To Me" line up. That said, you also have most of the drums for the King Crimson 72 - 73 set, that is, if you also have a 8 x 10 Premier Timbale and a 16 x 16 Hayman floor tom! Where does it end!!! LOL! You've also got the components for the kit he used with Genesis 76 - 77... 9 x 13 ludwig tom on left, 8 x 12 Hayman tom on the right, 16 x 16 Ludwig floor tom. That bass almost seems like a 20" but probably a 22".